This is the “Irresistible Chocolate” of Email List Building! Hey Health Coach, you are fabulous, your programs are amazing, and your freebies were crafted with tons of love. But you are still struggling to get prospects into your email list. Why? You need a Done For You Opt-In that makes people crave for the solutions YOU have to their problem! List building just got a whole lot yummier! 1. You are attracting the ideal client and you now have a chance to pitch your 1-1 sessions or paid program. 2. You have the chance to break the ice with your prospect, to start building trust! 3. You are able to build authority, create bonds and transform your prospects into loyal brand advocates! 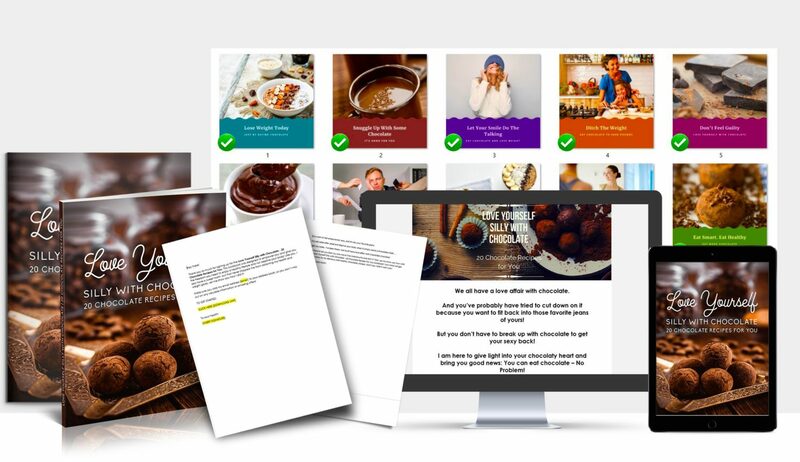 A Delicious Recipe Book with 20 Chocolate Recipes that are guilt-free, this professionally designed ebook will have your clients swooning over your content! Magnetizing 2D & 3D covers because we are going to transform you into a professional marketer for your business. An irresistible opt-in page done for you to plug n’ play into wix, wordpress, squarespace, leadpages. No need to spend money on a copywriter my Word-Slinger already did it for you! 10 gorgeous social media images to promote your freebie, proliferate your brand everywhere, and get people to notice you. 1 Event Banner Designed by a Professional so you can post it on eventbrite or FB, or anywhere else you want to further promote your freebie. The options are endless! 1 FB Social Media Post that you can use to promote further, in case you have writer’s block or you can even post it into a FB ad! A manual for you, coach to understand exactly how to implement this opt in freebie like an expert marketer of your business. Buy it. Brand it. Launch it. Everything you need to jumpstart your business is right here for ONLY $37. Love Yourself Silly With Chocolate – 20 Chocolate Recipes™ by Rachel Feldman is licensed under a Creative Commons Attribution-NonCommercial-NoDerivs 3.0 Unported License. RE-SALE OF ALL PROGRAM MATERIALS IS PROHIBITED.